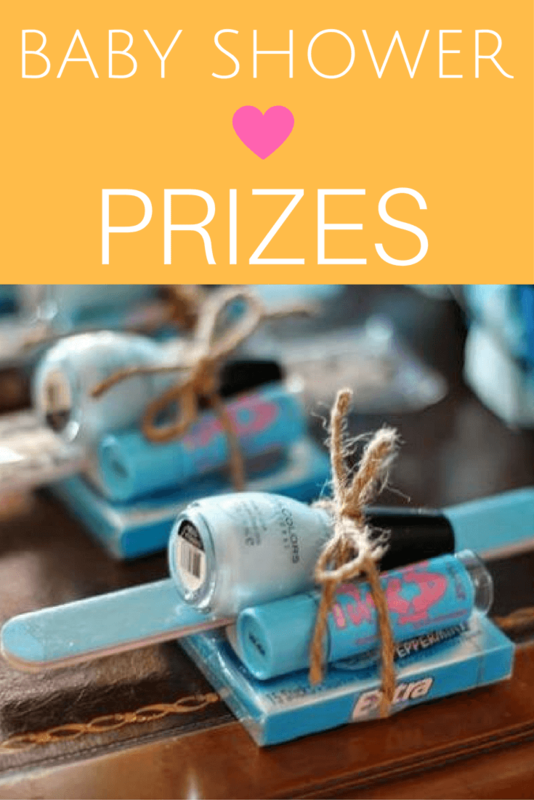 Royal Baby Shower Theme Ideas with bright blue decor! 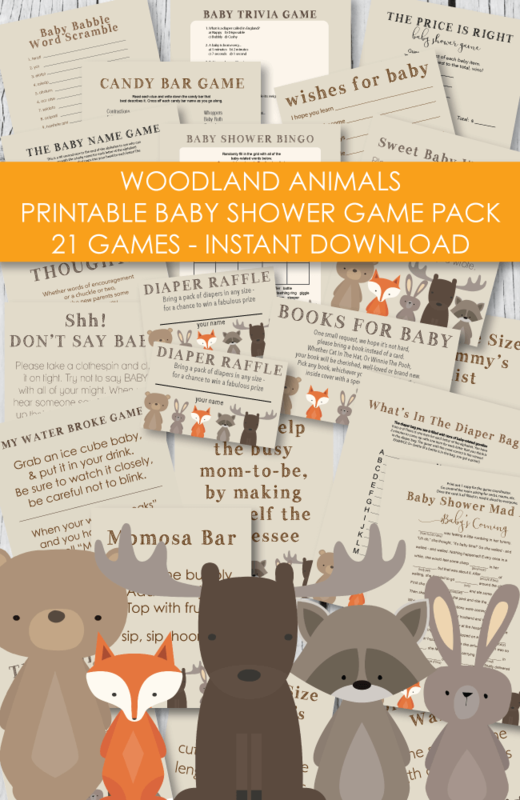 Luxury lovers, this baby shower is just for you. 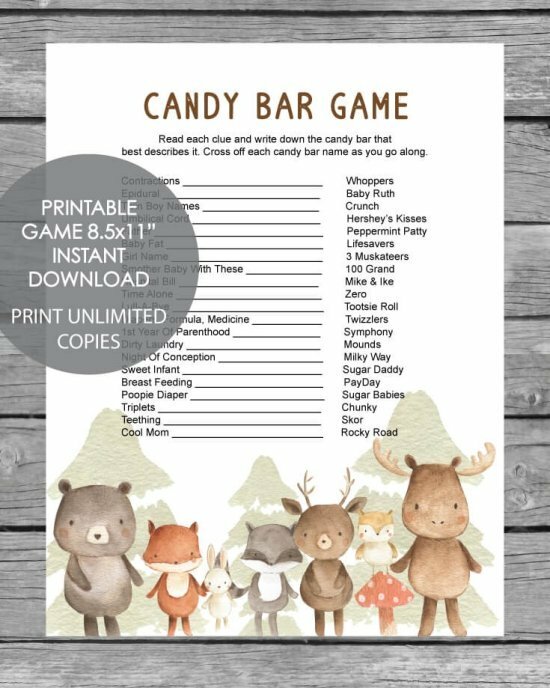 This “Royal Baby Shower” by Holly, of How Sweet, creates a simple, yet absolutely elegant, party that is fit for any queenly mother and baby. 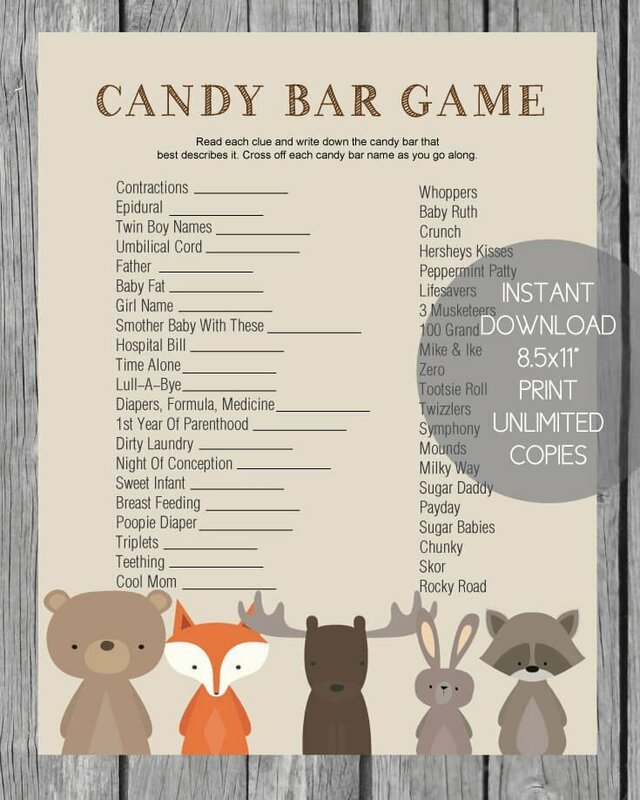 There aren’t many excessive add-ins but maybe that is what makes this baby shower so elegant. 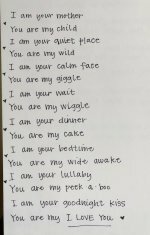 There are still ways to personalize the “baby day” and make sure it lives up to the parents’ dreams, even if it isn’t filled with many decorations. I absolutely love this idea for a cake. Placed in a beautiful china cake-stand, this is definitely a cake worthy of royal-tea time! 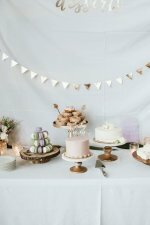 The cake-stand has beautiful flowers and leaves in different colors of pinks and blues. Golden stems line the flowers and give the cake-stand an imperial touch. 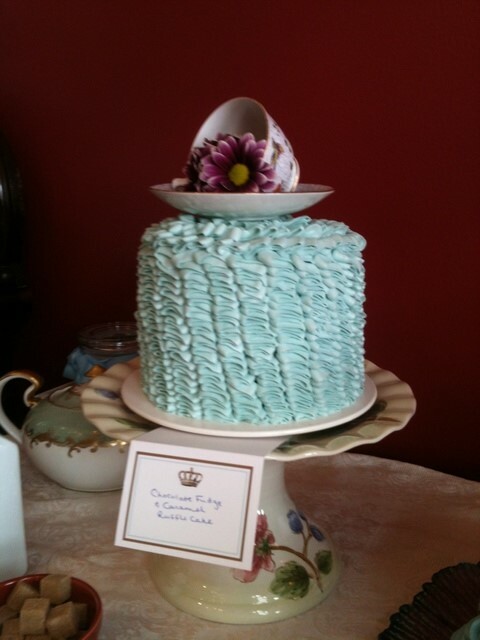 The cake itself is in beautiful stripes of baby blue, perfect for the soon-to-arrive prince. On top of the cake is a tea-plate with a teacup turned side-ways. Flowers of royal purple seem to pour out of the cup and into the tea plate. Teacups and tea kettles in matching china are also featured as both a perfect way to serve tea and add simple décor to a restaurant setting baby-shower. 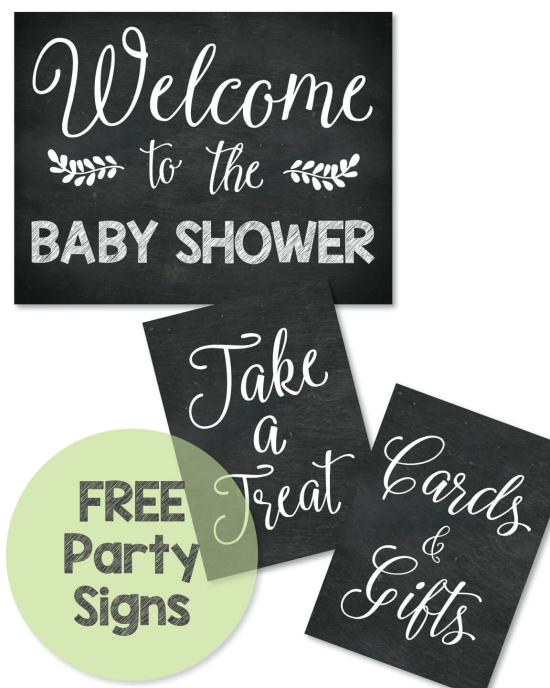 Again, I love the simple effects in this baby shower. 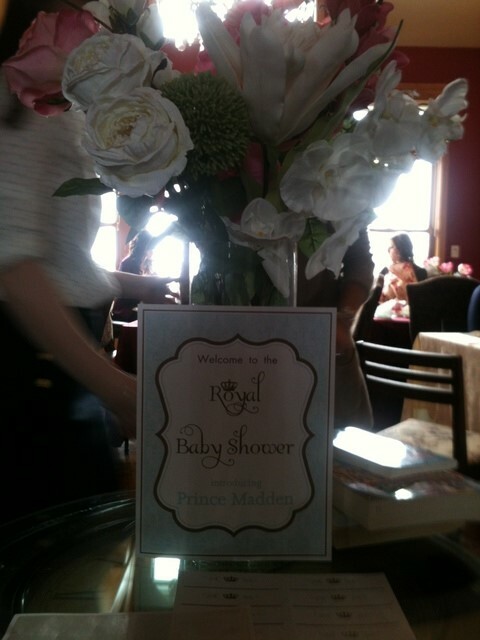 Make sure to have elegant signs welcoming the guests to the Prince’s baby shower. Glamor it up with a setting of roses and other flowers kept in vases. The contrast from the theme colors of baby blue and copper with flowers of pink and white is absolutely adorable. It adds a bit of a feminine touch to what would otherwise be a very masculine color theme. Also, this shade of pink adds a bit of brightness to the party! Cards that guests could sign for the Prince’s first birthday were one of the other activities. 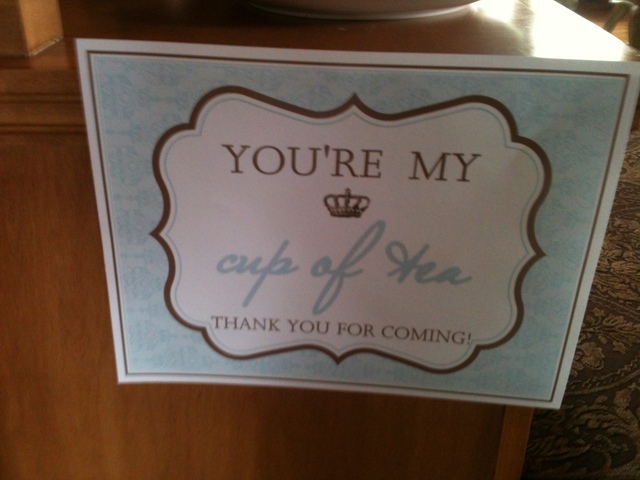 Also, Holly made nametags for each of the guests following the royal logo of the labels and place cards. 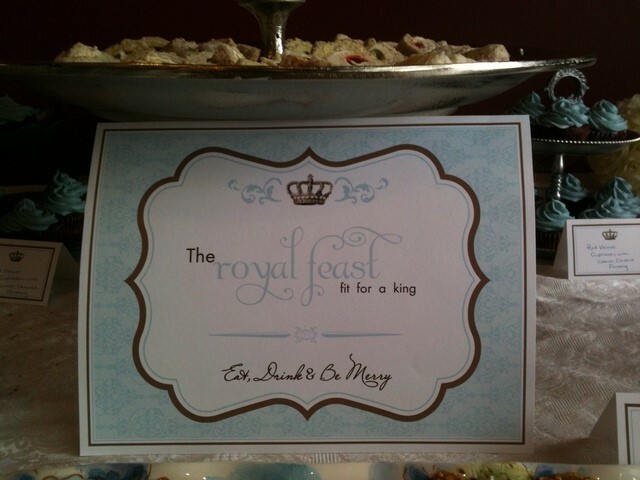 Holly’s labels had sayings like “The royal feast fit for a king,” or “long live sweets.” Sweets and desserts kept in silver plates and platters go along perfectly with the theme. What is wonderful about them is that they are favorite traditional kitchen items passed on through generations. 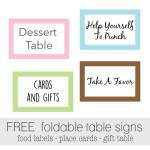 The mother or her close friends are sure to find some in their kitchen plate and accessories set! Finish off with wonderful goodies and thank-yous for the guests that shared on this occasion. What a wonderful way to escape our “normal lives”. Not only is this a perfect way to celebrate the good news for a friend, but it also leaves us feeling like kings and queens. Floral arrangements were the works of Catherina at How Sweet. 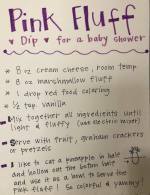 To see more of Holly’s baby shower creations, and Catherina’s flowers, check out How Sweet.